A 7-day old Mourning Dove nestling resting in hand. Image by Derek Stoner, April 6, 2011. The pair of baby Mourning Doves grew quickly, and five days after their first photo session I visited the nest again. The adult female, who sat on the nest brooding(warming) the young, flew away when I approached within 6 feet of the nest. I picked up the baby, noted that it seemed to have doubled in weight in just 5 days, took a couple photographs, replaced it in the nest, and watched the adult dove come right back to feed the babies. At this point, the babies were eating a diet of regurgitated seeds. Notice in the above photo how the feathers are emerging in orderly lines called tracts. 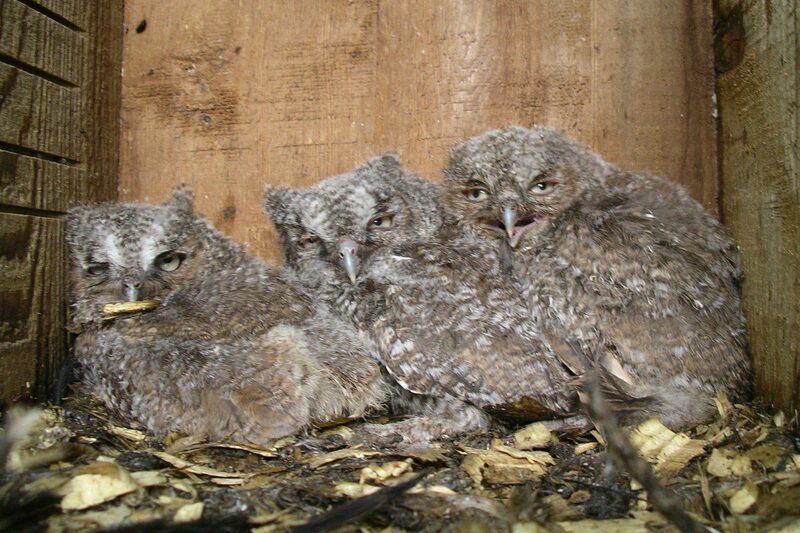 At this stage, the feathers are not providing much warmth or insulation, so brooding by the female is critical to keep the babies protected in cold conditions. 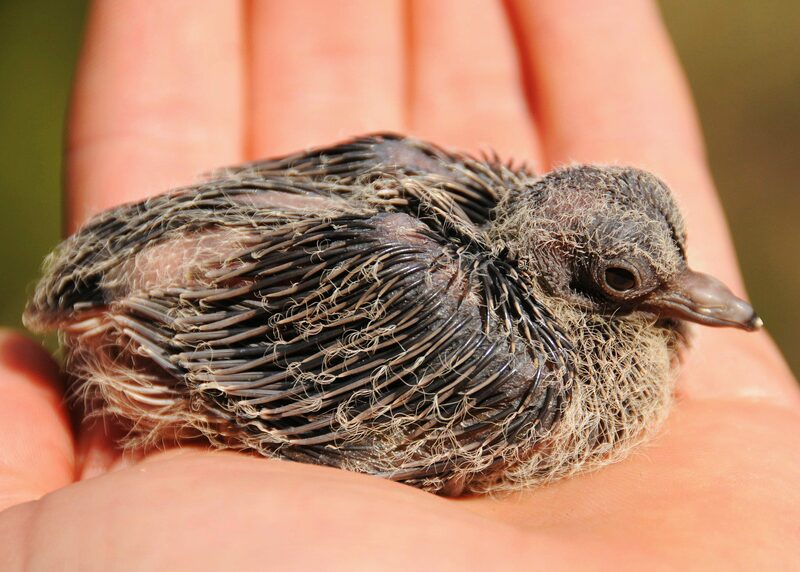 A fully-feathered baby Mourning Dove at 12 days of age. Image by Derek Stoner, April 11, 2011. Just five days later, on April 11, I visited the nest for the last time. I knew the babies would be close to fully-feathered and getting ready to fly in a matter of a few days. This time the young dove more than filled my hand, its long wings and tail hanging over the edge of my palm. Its weight had certainly tripled in just 12 short days of life. The fresh, full-grown feathers on the baby dove gave a very “scaly” pattern to its body. I carefully placed the dove back in the nest beside its just-as-big nestmate. The youngsters’ bodies spilled out over the edges of the nest and there is no way an adult dove could not sit atop these babies anymore! In the late afternoon of April 14, I decided to check on the nest, thinking the babies would likely be ready to fledge. In a stroke of luck(and with a co-worker as witness) , we watched the baby Mourning Doves perched on the edge of the nest. With the adult doves walking anxiously on a nearby rock wall, suddenly both baby doves took off in a whir of brown and white. Their wings felt the rush of air beneath as they experienced flight for the first time. In just 15 days, the baby doves transformed from a helpless naked chick with eyes closed, to a sleek and speedy flighted bird capable of speeds exceeding 60 miles-per-hour. The whole nesting cycle took exactly one month, from nest building to egg laying to hatching to fledging. Amazing! 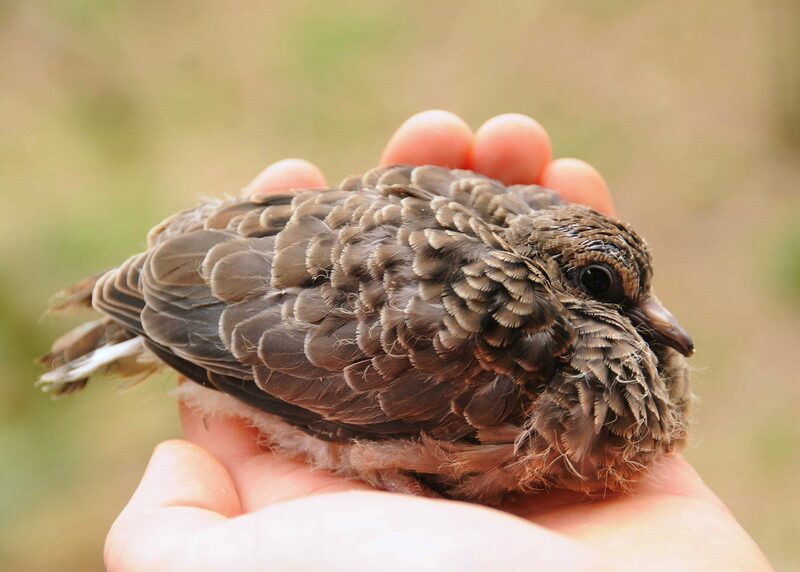 Stay tuned for Part 3, where we look at the important lessons learned from these baby Mourning Doves and how this story can help us dispel some common myths about birds. 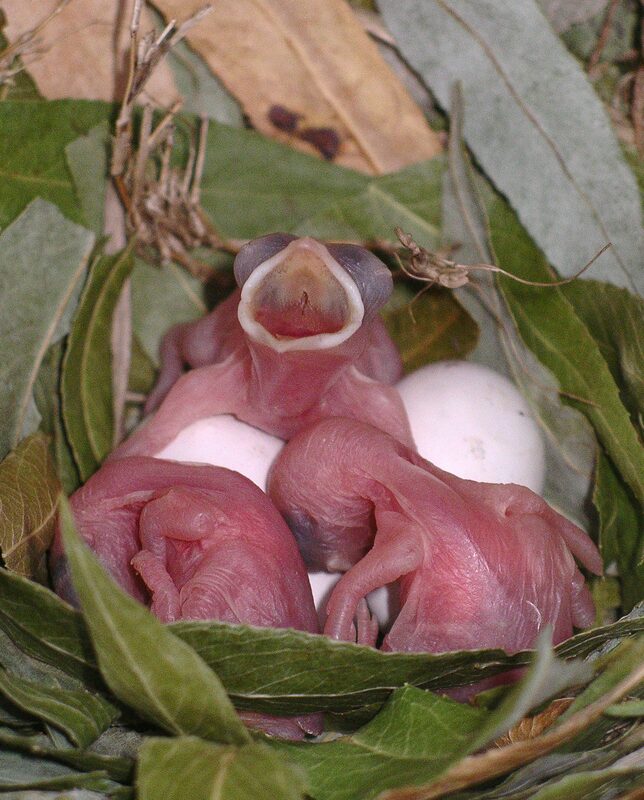 As surely as April showers gave way to May flowers, so does the world of birds spring forth with new life. 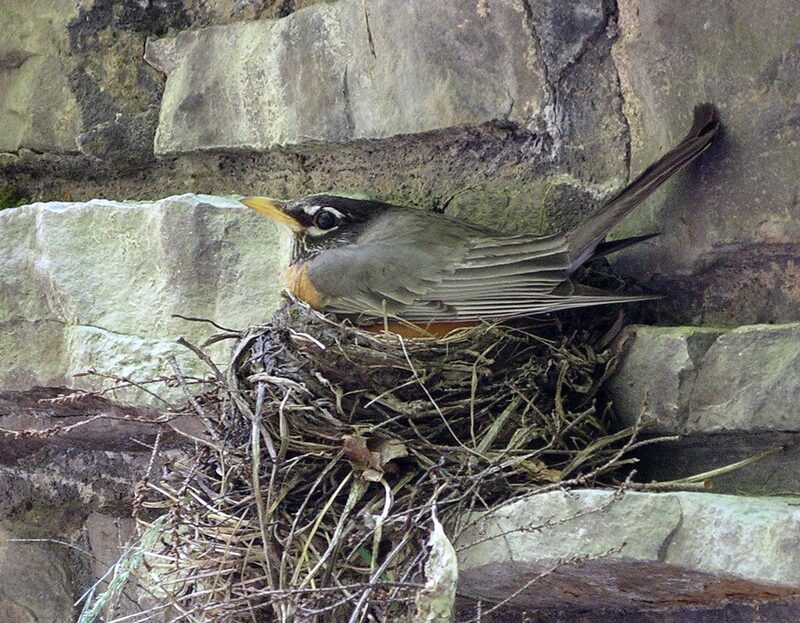 Everywhere you look, birds are building nests, incubating eggs, and feeding babies. Baby birds grow quickly and in seemingly no time at all are ready to leave the nest. During this critical time of pre- and post-fledging, baby birds sometimes have difficulties and wind up in the hands of a concerned human. The following is a story to help us all better understand the world of baby birds. 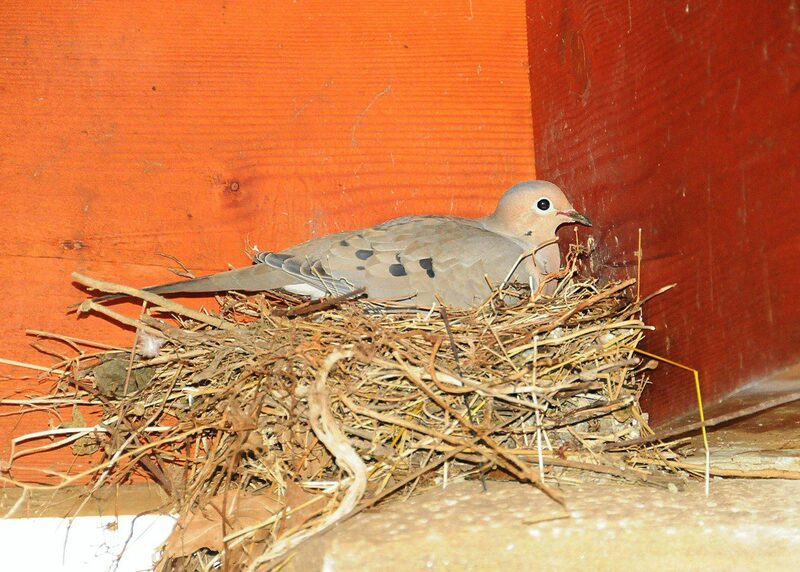 A female Mourning Dove sits on her nest, incubating two eggs. Image by Derek Stoner, March 28, 2011. On March 15 we noticed a pair of Mourning Doves outside of the Ashland Nature Center conference room, courting and then mating. Within minutes, both doves could be seen carrying small twigs up to the top of a stone support pillar, where a protected shelf area would hold their nest. Interestingly, the doves built their nests atop an American Robin nest from the year before. On March 18, I checked the nest and found two white eggs. Every single Mourning Dove nest I have ever seen contains two eggs, so I knew that the clutch was complete and the female would start incubating the eggs. With an expected incubation period of 14 days, that meant the eggs should hatch on March 31. 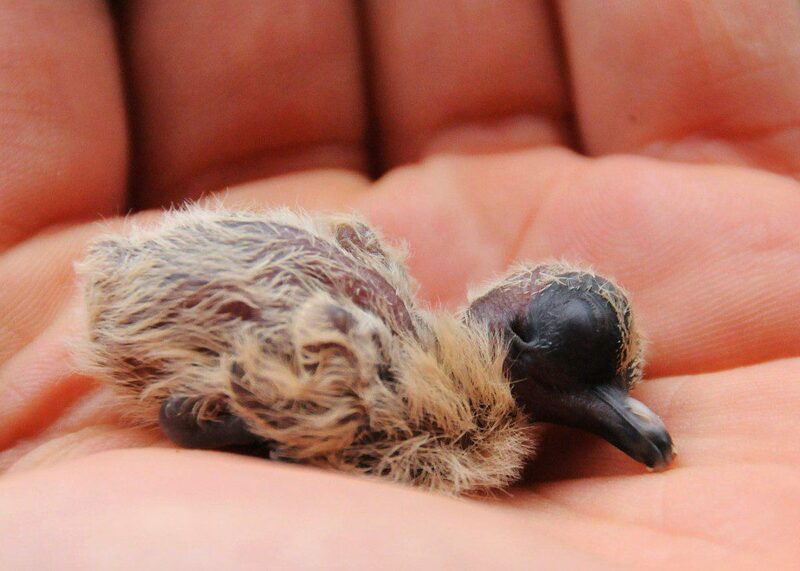 A 2-day old Mourning Dove nestling, or squab, nestled briefly in the palm of my hand. Image by Derek Stoner, April 1, 2011. The last two weeks of March had typically cold and wet weather, with some night plunging below freezing and a low of 25 degrees on March 25. Through it all, the female Mourning Dove stayed on the nest, keeping the eggs at a constant 102 degrees F. On schedule, two tiny, naked nestlings entered the world on March 30. On April 1, I visited the nest and began the careful documentation process of these baby birds. With the mother away briefly, I lifted one baby dove out of the nest, held it in my palm, and snapped a few photos with my other hand. Replacing the baby in the nest, I watched the mother return within less than a minute. Although I could not see the activity, I could tell that she was feeding her babies. Mourning Doves (and other members of the pigeon/dove family) feed their young “crop milk” which is an extremely nutritious protein-enriched fluid excreted by the crop of both male and female doves. For the first few days of life, baby Mourning Doves are fed an exclusive diet of crop milk. Not surprisingly, this diet helps the babies grow very quickly! Stay tuned for part two of this story, and see how these baby Mourning Doves grew and successfully fledged from the nest.